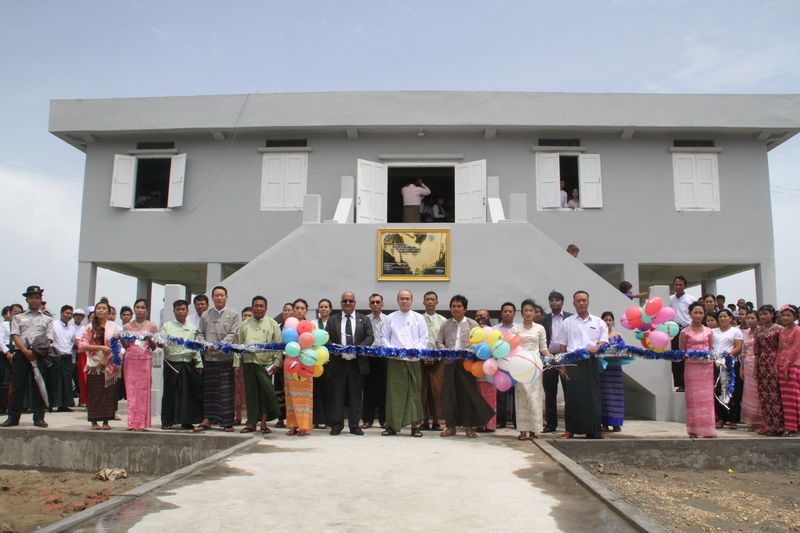 12 June 2018 – A handing over ceremony of a Multi-purposed Cyclone Shelter together with an Overhead rain water harvesting tank and double unit toilet for Oo Yin Kone village of Labutta township took place on 10 June 2018. 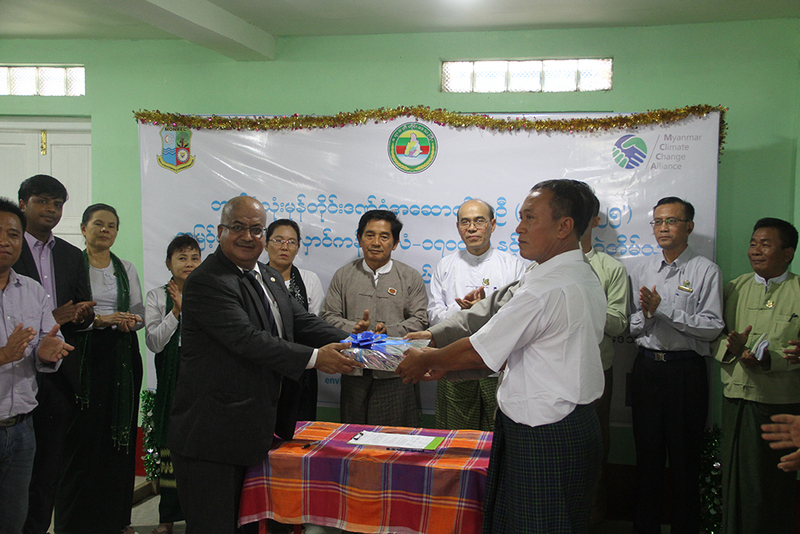 U Hla Maung Thein, Director General of Environmental Conservation Department, U Htun Hla, Parliamentarian of Ayeyarwady Region Hluttaw, Mr. Bijay Karmacharya, Country Programme Manager of UN-Habitat in Myanmar, Mr. Shashank Mishra, MCCA Programme Leader, representatives from Sin Chay Yar Lead Village Adaptation Committee (LVAC), and officials from national and regional offices of the Environmental Conservation Department attended the ceremony. 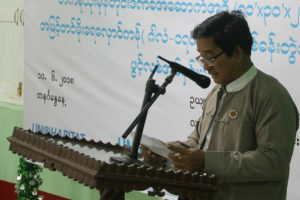 In his opening speech, U Hla Maung Thein, Director General of Environmental Conservation Department, spoke of the need to focus on climate change adaptation and mitigation measures for coastal areas such as Ayeyarwady and Rakhine state, by disseminating the knowledge on climate change, and the elements contributing to climate change and its impacts. He extended his sincere appreciation to the donors, partners and all stakeholders for their involvement in the project. In his remarks, Mr. Bijay Karmacharya, Country Programme Manager of UN-Habitat Myanmar stressed that unless urgent actions are taken at national, regional and local level, Myanmar stands to be significantly impacted by the effects of climate change. He noted that the cyclone shelter together with the other adaptation infrastructures would contribute much to improve the resilience of the Labutta community, particularly during the intensity of rains and floods. These included the immediate resilience benefits, given it key role in providing local residents shelter during floods, as well as the broader adaptive benefits, such as strengthening capacities of residents to maintain mobility and access to services and employment. He added that the approach and methodology of vulnerability assessment and implementation of adaptive infrastructure are to be replicated by other communities and neighboring townships. Parliamentarian U Htun Hla stressed that Labutta township is prone to disasters such as cyclone and floods as it is located in delta area,. 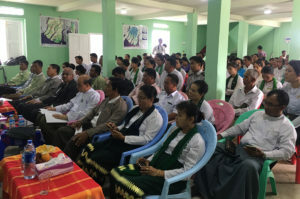 He said that it was important to empower local community to implement the climate change adaptation projects while raising awareness on climate change, mangrove plantation, and improving construction techniques on resilient housing. He also expressed gratitude and appreciation to the committee members for their leadership and commitment to their works. 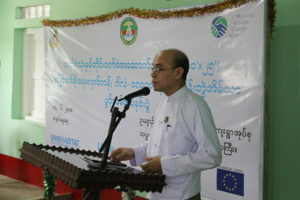 Myanmar Climate Change Alliance (MCCA) Programme, funded by the European Union, is designed to strengthen capacity in Government, private sector and civil society actors and to facilitate the Government in preparation of a national policy, strategy and action plans to address climate change. 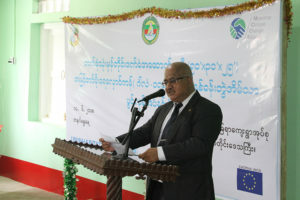 The project aimed to strengthen climate change related institutional and policy environment through sharing of technical knowledge and best practice, training and institutional support, and to promote evidence-based planning and policy making through pilot integration of climate change into sub-national and local level development planning initiatives. In Labutta Township, MCCA is implementing awareness raising on climate change, awareness workshop on mangrove plantation, planting mangrove 10 acres; vocational training on carpentry for men and sewing for women; Construction of multi-purposed shelter, overhead rain water harvesting tank (17000 gallons) for village tract level use, double unit toilet, sample resilient house, rain water harvesting tank for household level use, ponds fencing and training for improving construction techniques.